Block programming allows users to "write" programs by joining "puzzle" pieces that represent different operations in a program. It is a programming paradigm intended to facilite the introduction to programming to young programmers, thus is the recommended way for teaching programming and technology in primary and secondary schools. 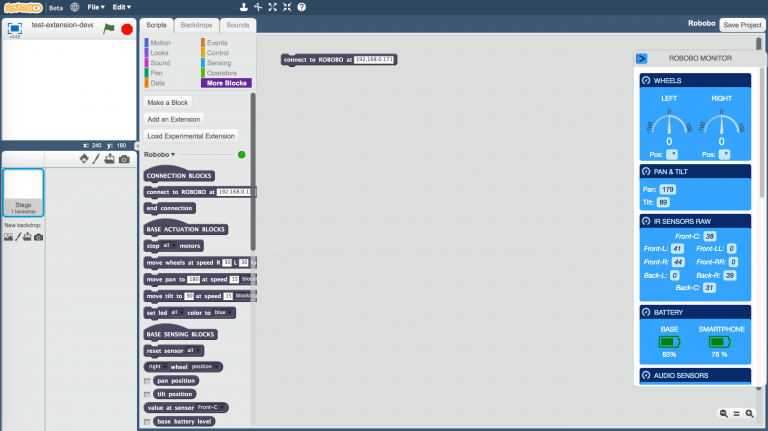 Robobo supports block programming using the Scratch block language in ScratchX. The programming manual of the Robobo robot using Scratch (English version). The programming manual of the Robobo robot using Scratch (Spanish version). A blog with news about the Robobo robot and STEAM.